Harold was brought up on a farm, and always had an interest in mechanical things. He and his dad started collecting old one-cylinder gasoline engines about the end of the 1960s. His collection numbers about 25 (ranging from a 1/2 hp New Holland to a 6 hp Cray Bros.) and his dad's collection has about 75 (from a 1/2 hp New Holland to a 12 hp Columbus). 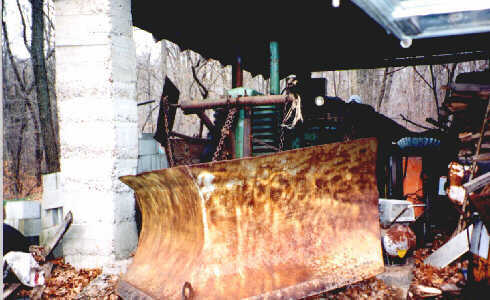 In 1980, we built a barn to house the engines and other antique farm related items. At about that time,our son spotted a tractor tucked away in an old farm building. As it turned out, the tractor belonged to one of Harold's old Sunday School teachers. No one was really collecting tractors back then, and so, we got it for a pretty reasonable price. This tractor is a 1937 John Deere Model B on skeleton steel *tip toe* wheels, with a two-row mounted culivator. It reminded him of the one they had, when he was a small boy, except that theirs was one year newer and had rubber tires. Our son, Wayne, and Harold have the '37 "B" about three quarters restored, but it sort of gets put on the back burner when more urgent things come along. A year after we finished the barn, we purchased our first two dairy goats. 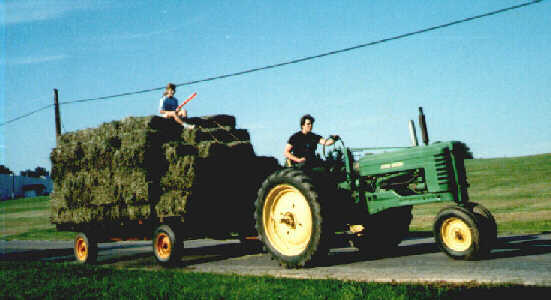 We didn't need much hay... or move much manure in those days. If we needed a tractor, we have two good farm neighbors, who in exchange for help with mechanical work, would let Harold borrow a tractor when needed. As the Stump Hollow dairy goat herd expanded, Harold purchased another tractor...a working one this time. 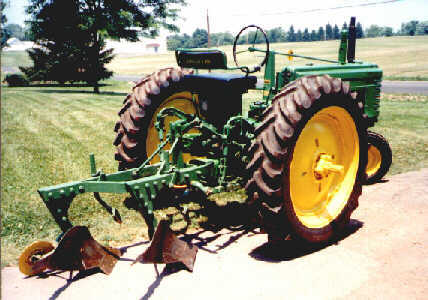 This is a 1950 John Deere Cyclone "B", with a starter, lights PTO & hydrulic system. 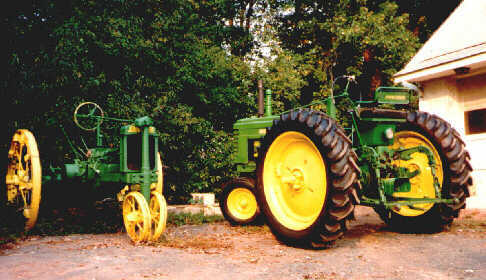 Next he bought a model JD #412 mounted two-bottom 14" plow for this tractor. Since one of our neighbors is now in his eighties, Harold has done all his plowing for the past several years. We also use this tractor, belted to a 1919 Heebner fodder cutter, to chop bedding and pull the manure spreader. 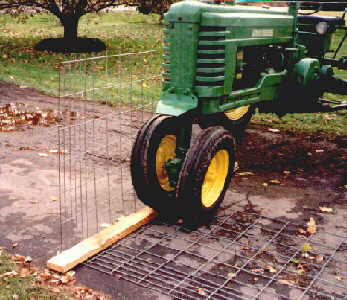 The tractor has also been used to help bend livestock panels. When Harold was little, he was very impressed with the enormous size of the neighbor's John Deere "G", to a child it was gigantic. 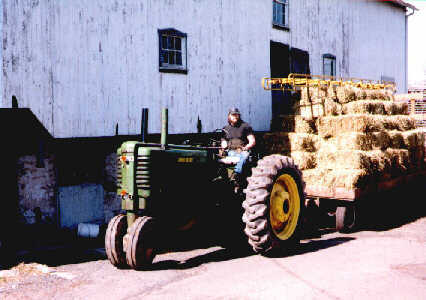 He met an elderly recluse, a few years back, who had about twenty goats and one of these huge John Deere tractors. It was a 1950 Model "G" with an eight foot v-blade snow plow all but permanently rigged to the front. The old man only used it to plow the drive open to the road in the winter. When he died, his son sold us the tractor and plow. That winter, when the Blizzard of '96 hit this area, that "G", with its' big old snow plow, was a real blessing, to us and our neighbors. We also use this big tractor with a large PTO manure spreader, and for hauling hay home (which we buy right out of the field) on those large Bale King wagons. Just as a final note.... the Model "G" weighs 6,040 lbs., and that great big snow plow weighs in at 860 lbs. Harold bought the latest tractor in November 1997, after searching for quite a while, and has been working (playing) with it, off and on since then. 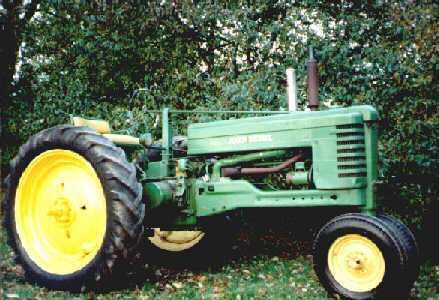 This one is a 1958 John Deere Model "520". Harold says, "Wow, what a step up". It has Power Steering, Float Ride Seat, Live PTO and a better hydraulic system. He is still looking for parts for the new 520, and eventually wants to convert it to an adjustable wide front end with 38" rears & flat-top fenders. A couple of months after getting this tractor, Harold located and bought a JD model #415 mounted two-bottom 16" trip plow for the "520". So now he is trying to get that ready for spring and plowing, his favorite time of year. Besides using the tractors on the farm, he also likes to show them, when he can. 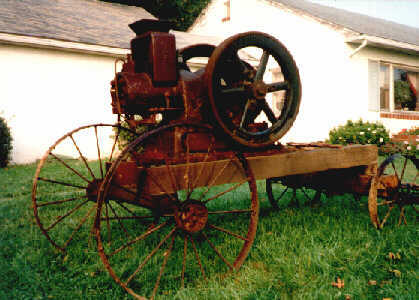 He belongs to the "Old Time Plow Boys" and the Bucks/Mont Two-Cylinder Club, and is planning to join another two-cylinder club. Harold and Wayne also have a Farm Toy collection containing about 400 pieces. Harold also has some interesting old one-cylinder gasoline engines. This is a 6hp OLDS hit & miss. 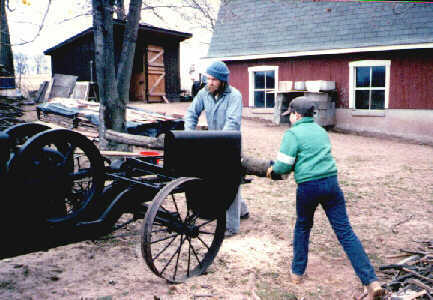 Harold and one of our young helpers buzz logs with the 1923 5hp Hercules saw rig. Want to join the Vintage Farm Tractor Ring? Tractor animation created by "Mike & Michael Costanzo"